Hezbollah leader Sheik Hassan Nasrallah urged Arabs and Muslims worldwide to support his guerrillas, saying Sunday that his group is fighting Israel on their behalf and that the battle has just begun. A confident-looking Nasrallah said in a speech aired on his Al-Manar TV that Hezbollah guerrillas were at their "full strength" and that the group had "no choice" but to hit the northern Israeli city of Haifi with rockets Sundayh after Israel struck civilians in Lebanon. "As long as the enemy acts without limitations, it is our right to act similarly," he said. Nasrallah said he taped the message at 1 p.m. Sunday, dispelling reports that he had been hurt in the massive Israeli bombing of his headquarters overnight Sunday as some Israeli reports said. The message was aired about six hours after that time. "We are in our full strength and power. We will choose the place and the time, and we will not let the enemy impose the means or place to use their weapons," he said. Facing criticism by some in Lebanon that Hezbollah dragged the country into a fight with Israel by snatching two soldiers last week, Nasrallah sought to rally Lebanese and the Arab annd Islamic world behind his fighters., painted the battle as a chance for the Arab and Islamic world to deal a defeat to Israel. "You Arab and Muslim people must take a position toward your future, the future of your children," he said. "The peoples of the Arab and Islamic world have a historic opportunity to score a defeat against the Zionist enemy ... We are providing the example." 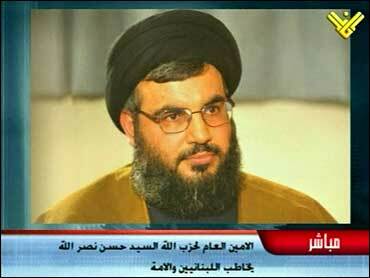 "Hezbollah is not fighting a battle for Hezbollah, or even for Lebanon, but for the Islamic nation," he said. He denied Israeli claims that Iran had sent members of its elite Revolutionary Guards to help Hezbollah. "I completely deny the presence of any Iranian troops," he said. "Lebanese are the ones firing these weapons. They talk about Iranians to diminish and humiliate us as Lebanese and Arabs, that we don't have the capabilities and experience." An Israeli airstrike on a civil defense building in the southern port city of Tyre killed at least nine civilians and wounded 42 others, Lebanese security officials said. The raid on the 12-story building adjacent to a hospital tore off a large section of the top three floors of the building. in the northern city of Haifa when Hezbollah rockets smashed into the city's train station. Soon after, Israeli warplanes bombarded the guerrilla group's headquarters in south Beirut again with a barrage of missiles, sending palls of smoke over the crowded residential area. U.N. Secretary-General Kofi Annan's special envoy, Terje Roed-Larsen arrived in Beirut Sunday and was holding a meeting with Lebanese Prime Minister Fuad Saniora, a Lebanese official said. Roed-Larsen came to the besieged Lebanese capital as a member in a U.N. delegation dispatched by Annan to diffuse the crisis. The team is led by Vijay Nambiar, Annan's special political adviser and includes U.N. Mideast envoy Alvaro de Soto. Saniora, Lebanon's Western-backed, anti-Syrian prime minister, indicated Saturday night he might send his army to take control of southern Lebanon from Hezbollah guerrillas - a top U.N. demand but also a move that might risk civil war. But on Sunday, Lebanon's president, Emile Lahoud, a staunch pro-Syrian and close ally of Hezbollah, vowed that Lebanon "will not surrender" and blasted the United Nations. CBS News has learned that an evacuation of Americans from Lebanon will most likely begin next week. U.S. security teams have already arrived by helicopter at the U.S. Embassy in Beirut. The State Department is authorizing "departure status" for non-emergency personnel. World leaders at the G-8 Summit in St. Petersburg, managing to resolve sharp differences over the escalating crisis, declared Sunday that extremist groups in the region cannot be allowed to plunge the Middle East into chaos and must immediately halt their attacks. The group issued a strong statement condemning Hezbollah militants but also urged Israel to exercise restraint in its military actions against Lebanon. Fears are mounting that the fight could expand across the region as Israel accused Iran and Syria - top Hezbollah backers - of supplying the guerrillas with sophisticated new missiles that hit Haifa. The Syrian government warned of an "unlimited" response if Israel attacks it. "Any aggression against Syria will be met with a firm and direct response whose timing and methods are unlimited," Information Minister Mohsen Bilal said. In Cairo, Egypt, on Saturday, the foreign ministers of 18 Arab countries passed a unanimous resolution calling on the Security Council to intervene to stop the escalating crisis in the region. The Arab League declared the peace process "dead" and asked the U.N. Security Council to start negotiations from scratch.